All of us are already aware that today, when we are at the threshold of 21st Century, the world is witnessing a revolution which we call information revolution, type of which was witnessed by the civilization in respect of agricultural revolution which was based on land then the industrial revolution which was on capital. The world is fast moving from a stage where the size and complexity of information and communication systems will be the barometer of a country’s development. Although the fall out of industrial revolution was to force people to come out from villages to towns, the information revolution, as we are witnessing currently, is expected to generate the reverse trends. As matter of fact, the information revolution is bringing the world community to a point where the idea of a global village has almost a reality, thanks to the revolutionary development in the field of telecommunications, computers and very high speed switching technologies. Arunachal Pradesh is strategically located in the extreme North-East corner of India and the road network has not yet been fully developed. Even now, there are some Circle Head Quarters, which can be reached only after 2 to 10 days foot march. There are 23 District Head Quarters, 12 ADC Head Quarters, 20 SDO Head Quarters, 17 EAC Head Quarters and 105 Circle Headquarters in the State of Arunachal Pradesh. There are 72 Police Stations, 12 Out Posts and 25 Check Gates. The department of Telecommunication (BSNL) network is grossly inadequate and telephone facilities are available only at few places. The BSNL network for interior areas of the state is not reliable and hence Police Wireless is the only channel of Communication, for law and order, as well as for State Government Administration. Arunachal Pradesh Police came into existence on 8th Nov’ 1972. The capital was shifted from Shillong to Itanagar in 1974. Arunachal Pradesh Police Telecommunication network was started by installing two HF stations for communication between Shillong and Itanagar. The Police Telecommunication network is also catering to the needs of civil Administration and 60% of the total traffic pertaining to message of civil administration. Moreover, during any exigency due to natural calamity, fire accident etc. APP Telecom establish temporary network for speedy execution of relief, evacuation and help. 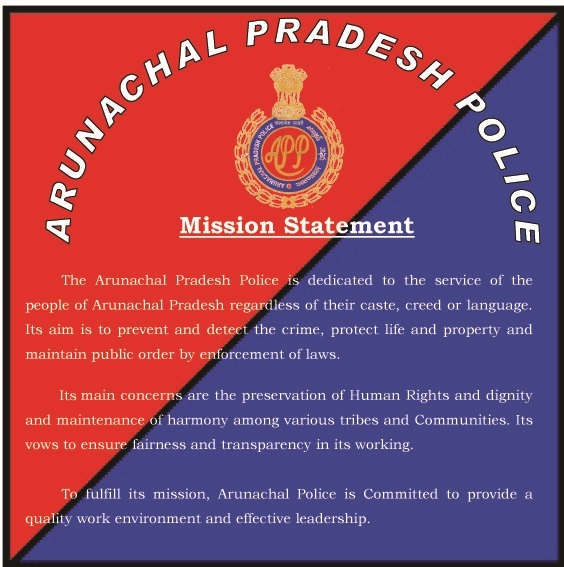 Thus Arunachal Pradesh Police Telecommunication network has an important role in the functioning of Civil Administration. Presently we are dealing with about twelve Crore groups (words) of messages per annum, out of which about eight Crore groups (words) of messages are from other Government Departments. The development works undertaken by the State Government through its Department like PWD/DRDA/Health/Education, etc. are carried out in remote areas, where there is no public facility for communication. Obviously all departments depend on Police Wireless network. Hence in absence of smooth functioning of Police wireless net work, developments works can not be executed smoothly. However, no charges are being levied for the services rendered by Telecom net work to all government departments, CRPF is also maintaining WT communication at some location and is charging for each communication at the rates applicable for express telegram, which is one rupee for each word. Thus, APP is saving the State Government about eight Crore Rupees per annum for transmission / receipt of non-police messages of various department of Government of Arunachal Pradesh. There are 19 stations with HF sets only, 29 Station with VHF Sets only and 70 Station have both HF & VHF Sets. We are providing WT Communication facility at 19 locations, which do not have any Police, present (CO/EAC Locations / DRC / LO Locations). We have provided WT sets at all locations which have police presence in some form or the other (Police Stations, Out Posts, Check gate). There are 63 Administration locations which are not yet covered by APP Telecom Network. APP Telecom organization is having the following type of equipments for voice / data communication. i) Cost of the equipment / maintenance is too high. ii) HF Communication is based on Morse methodology and this technology has become obsolete in most of the Police organization of India. iii) CW communication is the most unsecured communication as because any trained personnel can interrupt it. iv) CW communication mainly depend on ionosphere, hence its communication varies with the variation of atmosphere. i) The cost of equipment / accessories are very high. ii) The memory is less and hence limited number of messages can be stored. (C) VHF (voice) communication – APP Telecom organization is maintaining 99 VHF stations. Static sets have been installed at these locations and required sets have been fixed in the Police mobile and security vehicles. The VHF Communication system is more reliable than the HF Communication system. The HF communication mainly depends upon the atmosphere condition and the ionosphere in the space with changes its density and height ( with respect to Earth) vary frequently, hence the HF signal conditions also vary in accordance with the positions of the ionosphere layers in the space as such signal strength of the HF voice communication system is not reliable. Whereas the frequency band i.e. from 30 MHz to 300 MHz that is called very high frequency band is a line of sight (LOS) Communication from which the signal strength is not affected even if the atmosphere conditions are changing. The Cost of VHF set is very cheap in comparison to HF set i.e. Rs. 15,000.00 against HF set of Rs. 2,40,000/-. A. VHF NETWORK FOR DATA/VOICE COMMUNICATION USING REPEATERS. The range of VHF communication can be increased by installing repeater stations. With the help of repeater stations, we can also avoid so many obstacles within the LOS. It has been observed that the quality of signal even after 4 hope (repetitions), the signal found good and readable and data can also be transmitted by using VHF modem at both ends. 1. Intra-district VHF Communication: - SP’s can speak with all OCs, I/C Check Gates. 2. DHQ to PHQ and vice-versa :- PHQ to be linked to 56 PS out of 71 PS. 4. Mobile Communication can be covered at any place during movement of VVIP/VIP/Higher official. 5. Top management network in capital complex. 6. Local Communication for L/O arrangements. 1.Intra – district VHF Communication through repeater in (a) Papumpare district (b) Tirap (c) Chyangland (d) Lohit (e) West Kameng (f) West Siang. 2. Inter – District VHF Communication through repeater in (a) Khonsa (b) Bomdila (c) Ziro (d) Roing (e) Pasighat.Rest could not be achieved due to non-availability of equipments / infrastructural support / manpower. The DCPW, MHA Govt. of India has embarked upon a modernization plan by way of communication through satellite. It is one of the most reliable modes of communication as the satellite is accessible from any place in the country. This has now become feasible on account of the indigenous availability of satellite transponders and the relevant ground equipment, such as HUB, V-SAT (Very Small aperture terminal) which are capable of providing connectivity on voice / DATA / FAX. The project envisages installation of Central HUB, at New Delhi which will provide necessary switching and control for the entire network in the country. A hybrid V-SAT shall be installed at each State Capital (Mesh network) and a small V-SAT should be installed at DHQ (State network) for direct connectivity throughout the country on voice / Data / Fax. The Police Stations shall be linked with V-SAT (DHQ) with the help of MART (through EPBAX), thus any PS of the country shall have access to the information on crime, criminal and intelligence, etc of any other PS in the country.